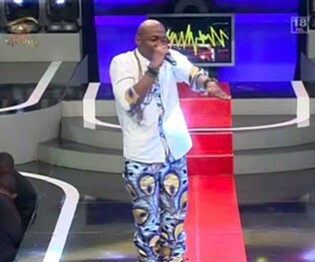 TOP local hip-hop rapper Tehn Diamond managed to steal the show last Sunday night during the Big Brother — The Chase Live Eviction Show. The rapper put up a scintillating performance when with his hit song “Grown Up Kid’’ driving the Big Brother audience into a frenzy. It was more of like a Zimbabwean show as fans had to sing along when he chanted “Grown Up Kid”. The rapper was later joined by Junior Brown to perform “Madrinks’’ and “Happy’’. Seriously comparing to previous artistes from other countries who performed during the live shows this year, Tehn Diamond proved to be the best. He was energetic and managed to control his audience despite the limited time. There is no doubt the upcoming musician raised the Zimbabwean flag high. According to some critics, the talented rapper did not only sing well but his fashion statement was off the hook. Just like other hip-hop rappers on stage they introduce a new style, Tehn Diamond followed suit with his traditional look. Yes, many can agree that he just did introduce the latest trend. The “Happy’’ singer wore a Zambian print trouser-like jumper with black socks, matching his tennis shoes. As what other famous hip-hop artiste do, they are expected to showcase latest labels, donning neck-chains and bracelets among others, but Tehn Diamond chose to be different. The rapper completed his African attire with customised beads, giving a different but satisfying look, a feat that should be attributed to his designer’s high level of ingenuity. Top comedian Carl Joshua Ncube agreed on fashion statement. “Only Tehn Diamond can get away with dressing like that! Only Tehn Diamond!” he posted on his Facebook account. Fashionista and brains behind Miss Curvy, Mercy Mushaninga said the rapper was indeed a trendsetter. “This is where it all begins. What he wore was perfect, as long people talk about it that’s fine. He is a trendsetter. Look how international celebrities like Justin Bieber, Lady Gaga and Kim Kardashian, among others, are doing it. They are famous because of their signature look,” she said. Tehn Diamond’s trademark of a happy face logo is also causing waves in the country. The musician is also a songwriter whose music career started in Australia. It is stated that he found fame in South East Asia and when he returned to his homeland, he finally broke the ice in the African market. Last week he was in United Kingdom together with Junior Brown and Take Fizzo for the Zimbabwe Stand Up Summer Jam 2013 concert.